Sally McAdoo Matlock died Nov. 18, 2018, in Nashville of natural causes at the age of 89. She is preceded in death by her husband, Joe Lanier Matlock. She is survived by her children, Anne McAdoo Ross and her husband Lock, Jamie McAdoo Brewer and her husband Craig, William Clemmons McAdoo and his wife Kim, and Sarah McAdoo Brewer and her husband Will; her grandchildren, Jackson Ross and his wife Lauren, Will Ross and his wife Patience, Emily Johnson and her husband Joseph, Benjamin Brewer and his wife Jennie, Cannon McAdoo and his wife Julie, Drew McAdoo and his wife Elizabeth, Clark Brewer and his wife Caroline, Campbell Brewer and his wife Kathyrn, and Sally Ward Woodyard and her husband Patrick. She has 14 great-grandchildren who were her heart’s delight in these last years. Sally dearly loved her husband Joe’s four children and their families: Pat and Janet Matlock, Barbara and Bill Haller, Mark and Kathy Matlock, and Craig Ingram. She began her life in Union City in 1929. Her parents were Sarah Nash and Eugene Hooper Campbell. She attended high school in Union City and started undergraduate school at the University of Tennessee at Martin. She was a campus favorite before marrying James McAdoo, and eventually having four children. In a few years she returned to college and graduated with a degree. Her boundless creativity and energy were a driving force in Sally’s life and she gave herself to many civic endeavors including a regional cookbook produced by the PTA at her children’s school. It was one of the first and most successful regional cookbooks of its day. She found a passion for antiques, opening a small antiques shop and eventually becoming an antiques appraiser. Over time she moved to Memphis and created her own business, Sally McAdoo Estate Sales. In this endeavor she handled household liquidations and appraisals of personal property for individuals, banks, estates and businesses. She frequently made visits to civic clubs and garden clubs to speak on current trends and values in the antiques markets. This career choice and deep love lasted for the rest of her life as she moved to Hot Springs, Ark., and eventually, to Nashville. Sally was a long time member of the Southern Baptist Church and had a strong faith in God. She desired to express her faith, at this time, to all that knew her and loved her, especially her grandchildren and great-grandchildren. For her, Jesus was her Savior, as well as her friend and brother, who was always with her, helping her, loving her and caring for her with love and tenderness. Her family wishes to express their appreciation to the care-givers at Richland Place Health Center where she spent the last few years, especially Pat Berry, Delores Legrand, Gloria Woods, Deborah Rogers, Becky Evans, Jackie Lawson, Yolanda Leavell, Yolanda Vannon and Latasha Seats. They are grateful for the kindness, laughter, and love you have shown her. You were the dearest of friends and we thank you from the bottom of our hearts. A visitation will be held Friday evening from 5-7 p.m. at White-Ransom Funeral Home. A graveside service will be held at noon Saturday in East View Cemetery. In lieu of flowers please send any memorials to Alive Hospice, 1718 Patterson Street, Nashville, TN 37203, or the First Baptist Church of Union City, 500 East Church Street, Union City, TN 38261. I remember “Mrs. McAdoo” from some of my earliest memories as a little boy in Union City which would be about 60 years ago. 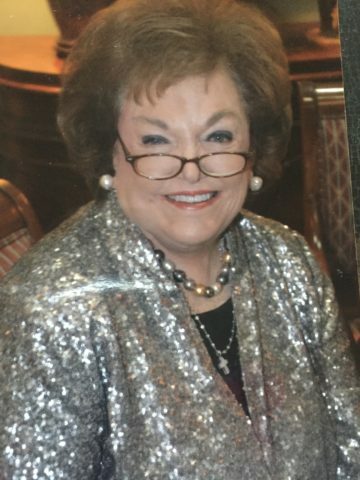 I later became aware of her as a leader in Estate Sales in Memphis, where I grew up, and more recently in Nashville, where I have lived for many years. What a grand lady! God bless the family and comfort you with sweet memories of a life well lived.